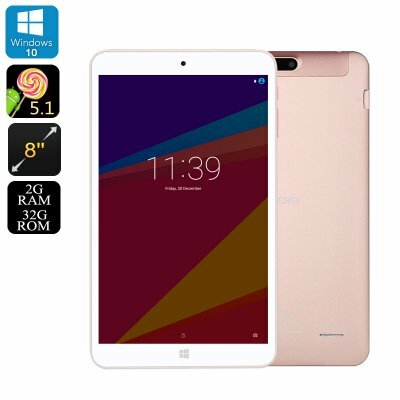 Successfully Added Onda V80 Plus Tablet PC - Windows 10 + Android 5.1 OS, Quad Core CPU, 2GB RAM, 8 Inch Display, FHD Resolution to your Shopping Cart. Available for under $100 the Onda V80 Plus is an ipad mini sized 8 inch tablet PC that comes with two operating systems. With an Intel Atom 64-bit Cherry Trail processor and 2GB of RAM you get plenty of bang for your buck. This quad-core CPU is more than capable of running the Android 5.1 and Windows 10 operating systems smoothly. Coupled with an Intel Gen8 HD GPU ensures amazingly visuals are enjoyed whether its films, games or surfing the web that takes your fancy. The 8 inch display boasts 1920x1200 (WUXGA) resolutions and brings rich colors and brightness, great for all you needs. Switching between the different operating systems is quick and easy from the Android drop down settings menu or an Android icon when in the Windows OS. The 32GB of internal storage is more than enough for both operating systems and with micro SD storage you can add up to 64GB of extra space for all your games and media. At under a $100 dollars, this is a choice tablet that brings all the mobile apps on Android as well as the portable office abilities of Windows 10. The Onda V80 plus has a sleek and stylish full metal body which is comfortable tools and looks exceptional with its rose gold matte finish. with the micro USB and Micro HDMI ports you can connect to peripherals or a large display with ease. With its affordable price and quite interesting features, is this a recommendable tablet for your kid or personally a tablet for casual games, browsing, and videos? A 4200mAh battery rings respectable usage times and with front and rear cameras you can snap photos or enjoy video calls on this very capable tablet PC. The Onda V80 Plus Tablet PC comes with 12 months warranty, brought to you by the leader in electronic devices as well as wholesale tablet PCs..